This is a sponsored post about Handmade Gift Tags #BICMerryMarking using #YellowGold BIC Mark-It™. is written by me on behalf of BIC® for IZEA. All opinions are 100% mine. Just when you thought permanent markers could not get any cooler, BIC Mark-It™ has brought them to a new level. 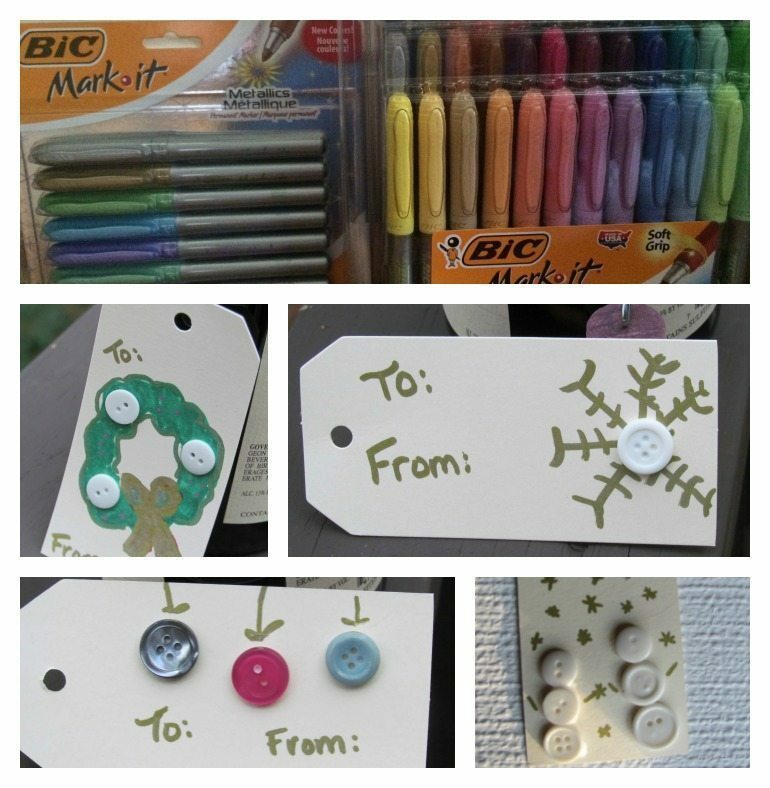 This year we created some Gift Tags and found using BIC Mark-It™ was not only fun but allowed us to be totally creative since you can write over permanent markers using the Metallic colors. While there are a lot of pretty gift tags available at stores, doesn’t it say a lot more to receive a gift with a handmade gift tag? We picked up a pack of plan gift tags at our craft store and then the creativity grew from there. We decided to make them three dimensional using a household item you probably have on hand, buttons. 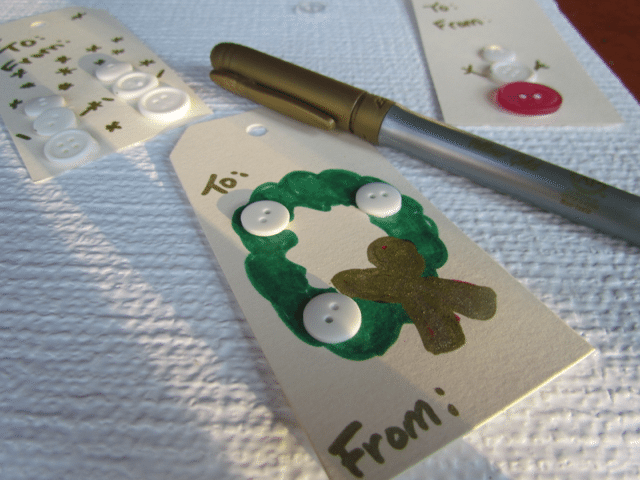 I bet you did not know how many different holiday themed gift tags you can make using a button. We made Snowmen, use different sizes and colors. 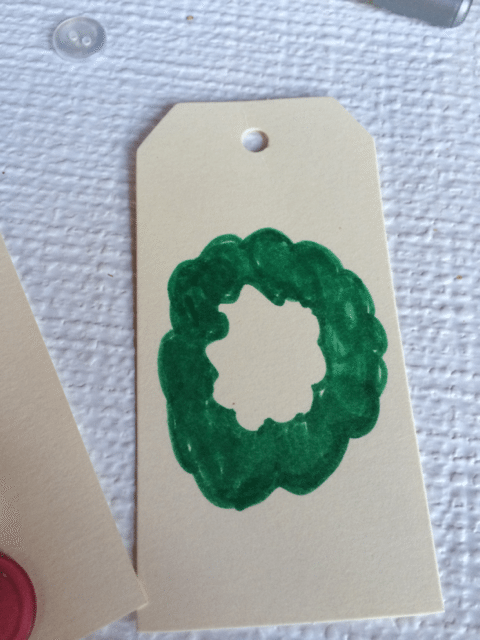 Make some ornaments hanging from the label for a fun holiday tag. A snowflake is like no other snowflake when you add a button into the middle. A Christmas Wreath comes alive when you add buttons to resemble holiday decorations. When you use the BIC Mark-It™ in #YellowGold you can easily color over the green as an overlay. I found this out the hard way as I was first trying it with another color and you could not see the difference. However, with the Metallic BIC Mark-It™ you will never know what color was underneath. If you need some inspiration this holiday season, be sure and check out their idea book. Join other crafters in the holiday merry and bright challenge.You can find BIC Mark-It™ permanent markers in 44 vibrant, long lasting colors for endless inspiration! The bold, fade-resistant ink is low odor and acid free (no added acid, no measurable pH) so you don’t need to worry!. You can find BIC Mark-It permanent markers available in 36 packs of fine or ultra-fine bold, vibrant colors or the 8 pack of metallic colors. What are you waiting for, get the booklet of merry marking and a coupon to start marking these super easy Gift Tags. While I have your attention, I nominate my 13 year old daughter, Melissa V. and Amy D. participate in BIC’s Month of Merry Marking. Love to see what you create !! How cute!! I love these tags! What a great idea to personalize each gift! My kids would love to do something special for each family member! I love these ideas. I’ve never thought of making homemade tags before. That is really great and makes it so much more personal too. These tags would be so much fun to make and a money saver! I am loving the snowflake tag. I am afraid that I wouldn’t be able to do with one of my girls she doesn’t like anything that had buttons on it. I love making handmade gift tags too! Those pens look like a lot of fun. 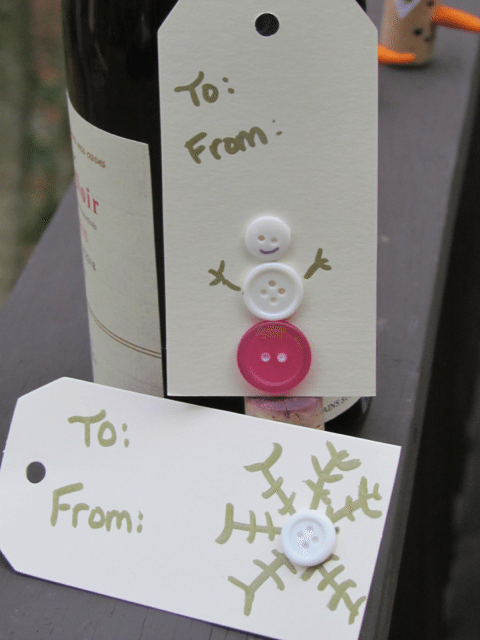 What a great idea to make your own gift tags! Love the metallic! I know they are like the new goto crafting tool! Carlee Love to see the gift tags with beads when you are done!! Love these markers and the tags are super cute! I like the Metallic markers and these gift tags that you made are so cute and I want to make these for my gifts this year. I think you did a good job. I like gift tags homemade! 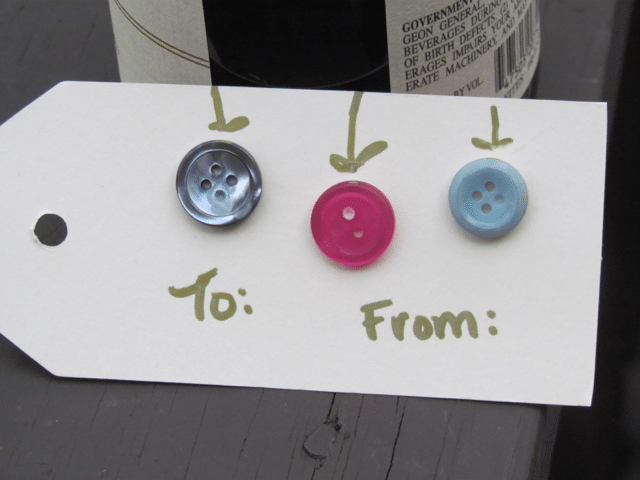 What a fun way to use buttons! My gram had a big tin of buttons and she’d let me go through them when I was a kid. For some reason that was a big deal to me. 🙂 I haven’t thought of it in years. Those gift tags are adorable. I actually have everything I need to do this and I have beads that I could put in the place of buttons. I have these markers and they are so much fun. I keep them hidden from the kids because they are *just* for mommy…especially when I get in the mood for doodling! These tags are adorable! I will have to get me some of these markers! I have the Bic metallic markers. I love them! Oooh! These are super pretty. I love pens, markers, and office supplies, but I haven’t bought any of these metallic markers yet. They need to go on my next shopping list. I love the metallic markers. And, you’re right a handmade gift tag is very special! What a cute idea! Love the colors and shine on these markers. What a great idea to do with the kids! They would have a ball with these markers for sure! I love bic markers. 🙂 When I was in school, the kids who had the coolest ones became instantly popular. They were all over the television and we all wanted the gel pens. Now I want the metallic ones! Especially when the kids make them. We end up using them after as a bookmark so we can remember what their writing was like when they were small.